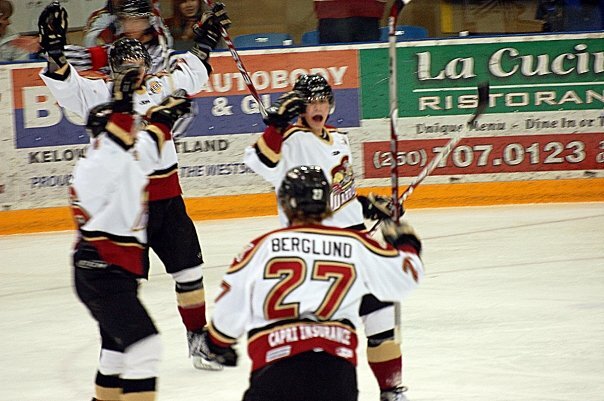 Kyle Singleton of the Westside Warriors (BCHL) celebrates after scoring. Last week I wrote a profile on Kyle Singleton of the Westside Warriors. I listed a few schools that he was in contact with. Turns out earlier this week Singleton committed to play for Merrimack College starting next fall for the 2011-2012 season and has accepted a scholarship. Singleton will join current teammates, Matt Cronin and Izaak Berglund, who are already committed to play at Merrimack. However, Cronin, who is a 92 birth year is not going till the 2012-2013 season. Yesterday, Singleton posted two goals in a game against the Surrey Eagles and was named the first star of the game. This was his first game back since after making his commitment. He is probably playing with a whole different level of confidence now that he knows that he is for sure going to be a division 1 level hockey player. This is great for Oregon hockey and shows the hockey world that good players can come from the state. Singleton’s achievements gives kids in the Portland area hope, and should give them confidence that it is possible to make it to the next level. I am very happy that Singleton finally committed. I was there since teams started showing interest in him. I have been waiting for this moment for almost four years. Merrimack has received a great hockey player on and off the ice. I could not be more happy for him. Congratulations bro!